President Trump is expected to ask for $716 billion in defense spending when he unveils his 2019 budget next month, a major increase that signals a shift away from concerns about rising deficits, U.S. officials said. The proposed amount represents a 13% increase over last year’s military spending, and it is entirely unnecessary. Defending the U.S. and meeting our treaty obligations do not require this spending increase. As such, any increase in military spending is a waste of resources that could be better used elsewhere. Taken together with tax cuts, a large boost to military spending is fiscally irresponsible. It is guaranteed to pile up more debt, since the only way that this administration is going to fund such a large increase is through more borrowing. Trump’s request is consistent with what we have come to expect from him. There has been an almost singular focus on throwing more money at the military while shortchanging the departments responsible for diplomacy and development. A larger military budget reflects Trump’s preference for military options over everything else and his willingness to escalate every war that he has inherited. The effect of this will be to militarize our foreign policy even more than it already has been. That suits Trump’s militaristic inclinations just fine, but it will continue to have a harmful, distorting effect on our foreign policy for a long time to come. A strategy of restraint wouldn’t involve keeping the U.S. in multiple foreign wars without end, and it wouldn’t be nearly as expensive. Trump’s preference for continued increases in military spending confirms once again that his foreign policy is the opposite of restraint. Posted in foreign policy, politics. Tagged Donald Trump, Pentagon. The problem is there’s no realistic alternative at hand to increasing employment, in the short time required by electoral politics. And worse, ending wars would increase unemployment as the economy has no capacity to employ those laid off from the military and its supplying employers. Long term, given will to do so by enough of the elites, manufacturing could be rebuilt. But do those who’ve benefited from the current situation want to make a change, or would they rather have a domestic regime change? The modernization is an investment in defense of our freedom…but factually its an expense whose only benefit is the spinoff technology that transitions to the private sector. Militarization is almost pure expense. Sure there are foreign nations that purchase our arms packages with private sector deals but whatever revenue made is spent on the police action or war or foreign bases etc. Thus the only justification is the great chess game of blocking your enemy from gaining a superior advantage or preventing a future war. Tell me though, does it look like we are economically blocking China from further military and technological advancement thru import taxes and other means which would advantage the US? No. The way forward is modernization not militarization. Its a mistake Trump knew in the campaign but has been deafened by neocons. Neocons want war. They want to play the global chess game. Neocons aren’t willing to let others lead so we can invest in modernization. Yes, the military budget should be less than $200 Billion. The money could be spent on something important. We stopped trying to make many things our people wanted and were buying. It also shortchanges services and infrastructure for regular American citizens. Not to mention that increasing the military budget amounts to rewarding failure, especially in the Middle East. Trump seems to think America is about supporting a huge standing army and military establishment, that we exist to serve the Defense Department in the fantastically wasteful and corrupt style to which it has become accustomed. Still no wall. Immigrants still pouring in. American jobs still leaving. Still no infrastructure work. Is this “America First”? Really? As Mattis said, we have to maintain not Defense but our status as being the sole arbiter of a liberal, rules based world order as interpreted by the world’s one superpower. What the Russians call the uni-polar world. So yes, it’s consistent with our strategy. Over 10yrs, we will spend at least $7T while complaining about a $1.5T infrastructure program as being unaffordable. The strategy is doomed to failure but like the Soviet Union we will have to find out the hard way. Sorry Fran, but it’s not going to increase employment in the areas where it’s needed most (the rust belt) but it allows people to think that Trump is doing something. Sadly, the military is just a welfare program for the South and midwest. Cut it and watch the usual suspects squeal. Somehow job cuts are okay in the corporate world, but not here. And yes, I am a veteran. 1). Tax the fossil fuel industry based upon the carbon put into the atmosphere. Start with a relatively small tax, then increase it as time goes by. 2. Use the revenue from the carbon tax to fund sustainable energy infrastructure development. Smart grid, solar, wind, and other alternatives. 3. Use the revenue to fund energy efficiency programs, targeting government buildings, small businesses, and residences. The above would provide rapid economic activity due to businesses and consumers investing to reduce the carbon tax, and entrepreneurs starting businesses to satisfy demand for more energy efficient buildings and manufacturing processes. Commitment to the program is a key to making the above to work. Businesses and individuals would have to be convinced that the carbon tax will remain in effect, and actually increase over time. Of course the above plan would probably never work, since The Republicans don’t want to tax anything (just borrow instead). For those that say sustainable energy is not economically viable, here is a link to a Guardian article that conflicts with that sentiment. You can’t be serious. Take 10% of the military budget and spend it directly in our country fixing crumbling bridges, upgrading passenger rail to the level of 1970’s USSR (forget getting to the level of 1990’s Taiwan, this is like a Mars landing), and provide Medicare for all. Watch the economy boom. When will you Trumpers finally admit that it’s not “neocons”, “deep state”, “fake news” – it’s your man? You voted for a con man, and the results are obvious. Agreed. It’s almost hilarious. You want to improve the economy? You want to make America great? Invest in the jobs of the future. As you note, infrastructure, as well as alternative energy, next gen tech, health care, education, education, education, education. And here’s the weird thing: if Republicans did the above they’d put the Democrats OUT OF BUSINESS. What’s interesting is that for all the supposed greater power of the office of the President (Cheney’s vision of a “unitary executive”) the power seems to be entirely concentrated in military matters. Declaring war, more war, more military. And yes, those who say that they were either betrayed by Trump or that Trump has been co-opted are deliberately missing the obvious: Trump is an ignorant, blustering, incurious, shallow, insecure fool who got them to vote for him because racial politics. To Trump’s credit, he never hid these things. From his first campaign speech to his last he was all of the above and more. And here’s what Bloomberg has to say about wind and solar power in Texas. Wind and solar are enjoying significant drops in cost as the technologies mature. Big Oil gets $7 Billion in tax subsidies a year. That is a story of a well connected industry that is dying and uses it’s political connections to last longer than it should. Let’s see: We have a choice of rebuilding our own crumbling infrastructure, or spending billions more on wars that generate far more terrorists than they kill. That’s a tough one……. 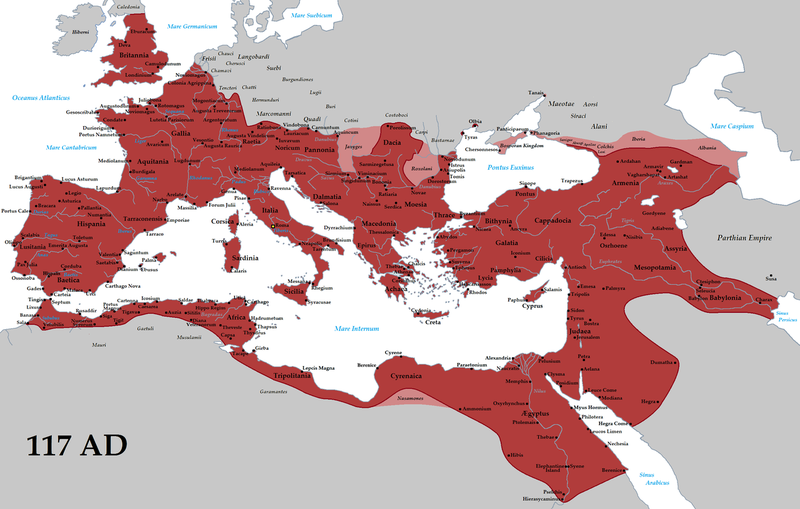 The Roman Empire reached its greatest extent under Trajan, but it didn’t last. We, too, are over-extended. Will we cut back before we are cut apart? Doubtful. And the Empire got 350 years after Trajan with which to figure out a lasting steady state, and could not. Yeah, the problem isn’t that we spend more on defense than the next 8 or 9 countries combined, because we actually do spend that much. The problem is that we don’t spend more than the next 10 or 11 countries combined.